To spa before the holiday or to spa during? That is the question. While prepping for holidays it’s tempting to have a session or two to get your body smooth, relaxed, beach ready and primed for the perfect tan. But the LVC answer has always been before AND during. And with the summer just around the corner, we’ve whipped up a wonderfully indulgent pick of the best of what’s on offer near Marbella. Firstly, you should know that when we spa, we absolutely do not mess around. We have very high standards. The overall experience is the key: our criteria includes everything from expecting a beautiful spa area, relaxing mood and serene facilities, seamless service, divine products, world-class expertise and intelligent spa treatments. We’re wanting a holistic approach with perfect relaxation areas that invigorate the senses, recharges the energy levels and balances mind and body. Address: Bulevar Principe Alfonso von Hohenlohe, 29600 Marbella. What: Thalassotherapy (the use of seawater, sea products, and shore climate in treatments). We’re all about bathing in the goodness of seaweed at the minute and love the way Thalasso Spa uses what Marbella has in abundance with its coastal location. There’s also a seawater pool, hammam steam baths and wood-burning Finnish sauna. Products: Thalion, Babor and Comfort Zone. We love: The Intensive body treatments which include body wraps and a specific-to-your-needs massage. Point of difference: Med view seawater indoor pool – seriously, it’s wonderful. Who’s it for: Single girls’ spa day treat, couples, star-spotters. More information: Marbellaclub.com or ask our Concierge to book your dream treatment. Address: Bulevar Principe Alfonso von Hohenlohe, s/n, 29602 Marbella, Malaga. What: Facials, massages, hammam, manicures and pedicures, hydrotherapy pool, cold plunge pool, experience showers, herbal steam room and a sauna set in a beautiful facility. Products: QMS Medicosmetics and Subtle Energies. We love: Vitamin C and Papaya Enzyme Peel 50 minute Facial. You’ll feel like you have new skin and fine lines diminished. Point of difference: Signature Senses Facial by QMS Medicosmetics has been developed exclusively for Puento Romano Six Senses Spa. Who’s it for: Everyone. This is one of our all-time favourite spas in Marbella. It has a wonderfully calming feel and is great for groups, frazzled mothers and couples. More information: Sixsenses.com or ask our Concierge for further details and reservations. Address: Calle Casares, 2, 29690 Casares, Malaga. What: A huge area full of natural light to spa in. Heated saltwater pool, saunas, Turkish baths, showers, relaxation lounge, Japanese bath (water maintained at a constant 10ºC) and a -12º snow cabin. Products: Biologique Recherche, Tata Harper and Hand Made Beauty. Point of difference: Thai massages and a very attentive team to serve you. They’ll supply reading material, delicious tea or thirst-quenching drinks before you’ve even thought about wanting them. Who’s it for: Couples and people needing to get away from it all for total relaxation. Oh, and ageing rock superstars, too – Axel Rose is known to spend weeks there. More information: Fincacortesin.com or again, our Concierge has direct contacts with the spa to ensure the best slots. Address: Kempinski Hotel Bahia, Carretera de Cadiz, Km 159, 29680 Estepona, Malaga. What: Indoor relaxation pool, Finnish sauna, steam room, ice fountain, heated benches and a relaxation area. We love: Their treatments and specially created spa menu for men – so many spas overlook the men. Our favourite is the Niance Men Revitalize facial. Products: Niance and Natura Bisse. Point of difference: Quartz Sand bath spa table (the only one in Spain). Try it, it’s dreamy. Who’s it for: People who might want a quick spa circuit and treatment or who like to spa-light. This Marbella spa is easy come easy go and very accessible. More information: Kempinski.com or get in touch with our Concierge to assist. Address: Urbanizacion Boladilla Baja, Crta. Cadiz km 163500, 29689, Estepona, Marbella. What: A real focus on healthy lifestyle with treatments using mainly aromatherapy and hydrotherapy. There is a designated swimming lane, sensation path, vitality pool with jacuzzi, warm cave, cold cave, salt cabin, caldarium, snow cabin, sauna, steam bath and flotarium. We love: Their Spa & Yoga sunset sessions with a 1 hour yoga class and 30 minute massage as well as access to the whole spa – an ideal treat. Point of difference: This is a wellness facility with luxurious surroundings; it particularly focuses on weight loss. More information: Healthouse-naturhouse.com or contact our Concierge as the first step to feeling wonderful! What: Elegant Romanesque-inspired spa facilities with luxurious surroundings. Four steam rooms with different essential aromas and temperatures (one with sea salt, one Greek sauna, two Finnish saunas), a very atmospheric dynamic swimming pool, a flotarium and a Laconium as well as a treatment room with oxygen bubbles (yes, the ultimate treatment room). Products: Piroche Cosmétiques, Carita, Micro Puncture Lab©. Point of difference: The Roman plunge pool is pure elegance. This luxurious spa is the best for celebrity spotting, too. More information: Villapadiernawellness.com or contact our Concierge who looks after our guests just next door. What: A men’s barbers, coffee lounge and spa treatment club. Modern, fashionable and cutting edge, this place offers men’s facials, tanning, massages and grooming. We love: That men are taking care of themselves – swoon. Products: Penhaligon’s, Uppercut and Creed. Point of difference: It’s all about the men and that’s unique in Marbella. What: A full-blown health retreat high up in the hills above Marbella, this is the place to head for everything from a good, old-fashioned mani-pedi or a massage to a spot of Reiki healing. We love: The zen-like calm that runs throughout the place – SO relaxing. Point of difference: The Spa & Yoga day package: welcome drink, sauna and steam room, group yoga class, 60 min. massage, lunch, facial and herbal tea. It really hits the spot if you’re looking to get in shape mentally and physically. Want to wrap a trip to one of our favourite Marbella spas up into the perfect pamper day? 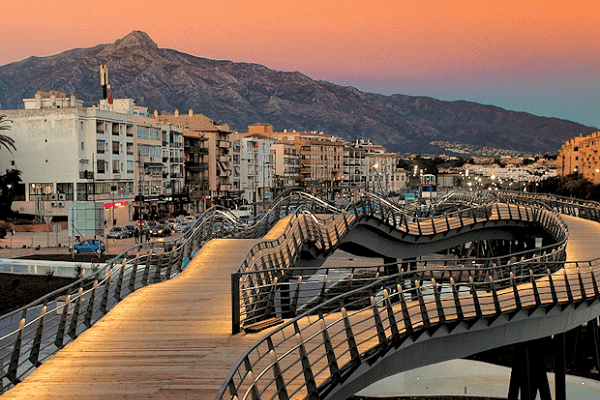 Check out our essential guide to Marbella shopping. To make sure your stay in southern Spain is as healthy and relaxing as possible, why not consider one of our retreat villas? Lindsay is the co-founder and collection curator of The Luxury Villa Collection. She's constantly in search of the most authentic and original travel experiences out there to help you see Spain in style.